I became a grandfather in the summer of 2004. There is a very special attribute that children bring to our world. 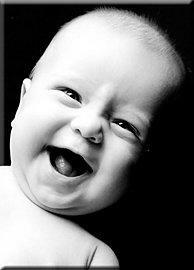 When children laugh, immersed in that remarkable new world that belongs to them alone, the whole world smiles. It is laughter born of innocence and delight, and it ricochets around the walls, a golden light of happiness bouncing behind it. It makes me smile to think of it. Thank God those babies are born. We would miss that sound if it were silenced. I believe there are places where the angels fly, and the children play. And we are granted the privilege to listen. It is a part of heaven that has somehow crept in and surprised the earth, leaving a beautiful handprint behind. Embrace the paradox, and hold it tight.